Presidential candidate of ruling Progressive Party of Maldives (PPM), President Abdulla Yameen Abdul Gayoom and his running mate Dr. Mohamed Shaheem Ali Saeed, have submitted their candidacy forms to the Elections Commissions (EC), making their run official in the upcoming elections on September 23. 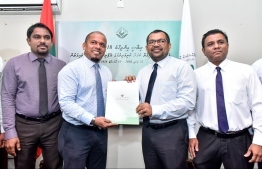 The forms were submitted by Minister of Tourism Moosa Zameer, who is also the vice president of PPM, at a ceremony held at the EC. President Yameen is currently on his campaign trail in Huvadhoo, making stops in both Gaafu Dhaalu and Gaafu Alif atolls. Yameen is the third candidate to submit candidacy for the upcoming elections. The previous candidates include Ibrahim Mohamed Solih (Ibu) and his running mate Faisal Naseem from the opposition coalition. 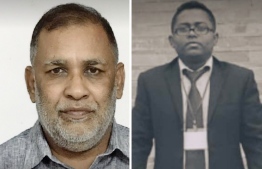 Additionally, independent candidate Hussain Naseer and his running mate Sheikh Nasrullah Mustafa have also submitted their candidacy forms to the commission. However, EC has yet to report their decision on Hussain Naseer's submission. Former Minister of Home Affairs Umar Naseer and former vice president of Local Government Authority (LGA) Shujau Hussain have also announced their decision to run for this election. However, they have not officially submitted their candidacy forms yet. The unanimous decision to elect President Yameen as the ruling party's presidential ticket was made during a PPM council meeting. In the 2013 elections, President Yameen beat out the contending candidate Umar Naseer for the PPM presidential candidate. According to PPM, the presidential ticket was given to President Yameen in accordance to the party charter. Furthermore, PPM also states that under its charter, should the current president make the decision to run for a second presidential term, he can run for the new campaign without holding a party primary. Nonetheless, former members of PPM have stated that if the party were to bypass the process of primaries, it should be carried out in consensus with the party congress and not just by the council. Elections Commission is scheduled to accept presidential candidacy forms till Friday.